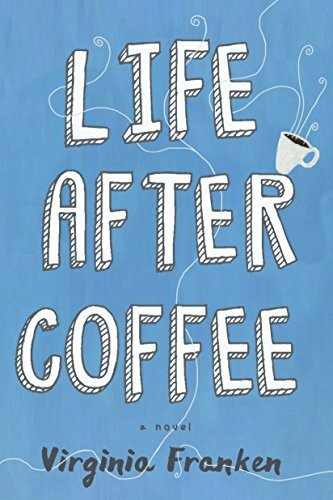 In her entertaining debut novel, Life After Coffee, Virginia Franken offers us the story of coffee buyer Amy O'Hara, who has devoted so much time to her career that she has become disconnected from her husband and two children. When Amy loses her job, she's really left floundering--especially when her stay-at-home husband decides to turn the kids over to her so he can finally finish that screenplay he has been working on. This is a comic novel, funny enough that certain bits will have you snorting tea through your nose. But it's also a surprisingly profound meditation on that age-old question of whether any woman can have it all. The weird thing is that, before I wrote the novel, I didn't even drink coffee! But I was looking to dramatize the conflict of a mom with extreme work/life balance issues, and thought of a friend of mine who traveled the world setting up coffee franchises for a major chain. She loved the job and was the family breadwinner, but the incessant globetrotting meant she was missing her kid's childhood. So she quit. Initially I kind of ran away and hid from the idea as I knew nothing about coffee at all, and it seemed like such a vast subject. But I did find it interesting, and then, as I started the research, I quickly became infatuated with the stuff. The first time I drank a proper cup of coffee, I literally heard angels singing and had this insane moment of euphoria - baristas call it the "Godshot moment." I was like: So this is what all the fuss is about. Now I'm hooked just like everyone else. Q. Amy O'Hara, your protagonist, is definitely flawed, at times to the point where we want to slap her silly because she makes such dumb mistakes. At the same time, we're rooting for her to succeed. That's a tricky balance in fiction, creating a character who isn't always likable, because you risk alienating your readers. What inspired you to create this compelling character? I'd like to say that I purposely set out to create a character who was flawed-yet-compelling, but Amy just kind of happened all on her own. She's got so much more sass than I have, and I think it's just fun to watch someone do and say things that you never, ever would. For me, fiction's all about having an emotional experience without having to physically go there and get dragged though the experience. I get as much pleasure from writing books as I do reading them, and writing fiction is simply me getting to live an alternate life where I can see what happens when I say and do things I'd never get away with in the real world. It's funny, because I never really realized that Amy was a bit of an anti-heroine until there was something of an uproar about her slightly wild choices. Q. It isn't often that you find a novel like this one, with a first-person narration that zips along with so much energy and humor, then delivers a one-two emotional punch that you never see coming. Congratulations! What made you choose to write in this particular voice? Is it close to your own natural speaking style? Oh, thanks! My friends and family say the narration is pretty much like me talking to them after about half a bottle of wine, so I guess Amy's voice is very close to my own natural speaking style! I had the morbid thought the other day that, after I'm dead and gone, if my kids miss me they can read the book and it'll be like their crazy mother's back in the kitchen talking at them. My grandmother was a librarian, and my parents are both voracious readers, so all my life I've been surrounded by stacks and stacks of novels. The women in our family trade fiction like some women trade recipes. My mother's also a big storyteller. Doesn't matter if the story isn't completely true, just as long as it's entertaining enough to keep whoever's around paying attention. Over the years she's learned to twist the most banal stories, about the most banal subjects, and create these crazy tales with outrageous conclusions. I think it's just how she sees the world. And why not? As one of my dance teachers said: You won't give up dancing, dancing will give you up. So I don't think I ever made the conscious decision to give up dancing as a career, it just kind of dropped out of my life. I had a brief career as a professional dancer and though I traveled the world and it was amazing, it was definitely a tough gig and I wasn't sorry to move on to other things. Mind you, I gave up on it earlier than I could have in order to pursue a certain romantic relationship, and looking back I don't know if that was a good choice. That's actually one of the themes of my next novel: letting love get in the way of achieving your dreams. I think being a dancer has made me approach the rhythm of dialogue and text in a slightly more varied way than I might otherwise. As a dancer, you are always working within, and against, rhythm and I think a lot of that finds its way into my writing. A background in dance has actually been a great grounding for writing novels. Training to be a dancer is pretty grueling, and you learn to push yourself through exhaustion and keep dancing on bloodied toes when you'd really rather just sit in a quiet corner, eat some chocolate and go to sleep. Of course, these days I'm allowed to eat all the chocolate I want, and no matter how much I type, my fingertips never bleed! Q. What advice can you offer to other debut authors hoping to launch their first novels as successfully as you've done? I think the most important thing when publishing your first novel is to have something out there that you feel really great about. And then, whatever reaction comes your way, at least you'll know you've got something out in the world that you're incredibly proud of. My publisher, Lake Union, helped me pull Life After Coffee into shape without changing its spirit, but there really is a kind of nebulous balance between making edits and decisions based on what those who are more experienced than you have to say, and maintaining the original feel of a book. That's one of the hardest things about being pretty new to all this, knowing when to stick to your guns on any topic, and then knowing when to shut up for a minute and listen to what people much more knowledgeable than you are trying to tell you.